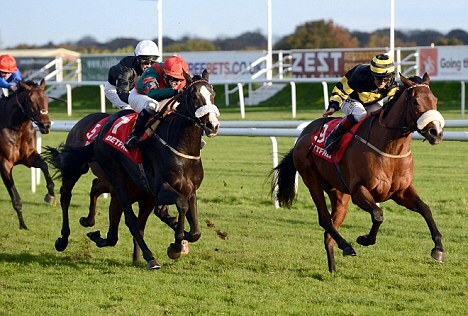 The November Handicap is the last big race of the flat turf season in the UK and is held at Doncaster, also the venue for the Lincoln Handicap which traditionally opens the season in March. Favourites do not have a good record in the race with Snow Princess the last to succeed in 1995. Trainer John Gosden has won the race on five occasions whilst Brian Ellison has won it twice in recent times. York winner Lahaag is certain to be among the leading contenders as he hails from the John Gosden stable. He disappointed in the Lincoln here at the start of the season but looked a different horse last time when coming from off the pace to win under Paul Hanagan. He carries a penalty for that success and will almost certainly be held up for a late challenge. The likely favourite is Conduct who represents William Haggas. He was formerly trained by Sir Michael Stoute and was off the track for a year before making his debut for Haggas. He gave plenty of encouragement on his latest start when third to Clon Brulee over this course but is yet to tackle a mile and a half. Her Majesty The Queen enjoyed Group One success at Royal Ascot this summer and could end the season with another big race success. She is represented by Roger Charlton’s Border Legend, a good winner at Nottingham last time. Another horse with a leading chance is course and distance winner Forgotten Hero. He looked to be struggling under Jamie Spencer that day but kept responding to his rider’s urges and eventually got up to win. A 3lb penalty may not be enough to stop him getting involved at the business end if he can be persuaded to put his best foot forward. Richard Fahey’s Hi There won well at Newbury and 5lb claimer Samantha Bell has been booked to try to nullify the penalty. This is also a step up in trip but the horse is well and Fahey has enjoyed a stellar season. Andrew Balding’s Communicator was second to Art Scholar here 12 months ago and now races off a 3lbs lower mark. He has not been in the same form this season but shaped nicely at Chester in August and could have been laid out for this race. He could be good value at 20-1 with Bet365. Nicholascopernicus finished down the field last year but chased home Lahaag at York before plugging on behind Thomas Hobson at Newbury. Trainer Ed Walker celebrated the biggest win of his training career when Ruscello won the Lexus Stakes in Australia last weekend and will be hoping that Nicholascopernicus can run a big race here. David O’Meara’s Open Eagle won on his British debut having been bought cheaply from France. He sweated up and ran freely that day but still had plenty in hand and will be interesting if he is allowed to settle in front. Richard Fahey also runs Kiama Bay who won at Chester earlier this year. He was badly hampered in the York race won by Lahaag and that form can be ignored and he ran third at Wolverhampton subsequently. Bohemian Rhapsody’s winning run came to an end at Newmarket last time having previously chalked up a hat-trick. This would be a major triumph for former jumps jockey Seamus Durack if he could land this prize. Highland Castle has always threatened to win a big race but can sometimes race too keenly and may struggle to see out this stamina test. Top weight Aiken has been out of sorts this season but his Ascot run was clearly not a true reflection of his ability and he could make a bold bid for the Gosden and Buick combination. Shrewd has form in the soft, whilst Twelve Strings and Nearly Caught are others to consider in a wide open contest.